Since Saturday, I've been closely watching and listening to news stories coming out of the Philippines. The city of Manila - home to around 15 million people - was struck by Tropical Storm Ketsana, which dumped double the rainfall of Hurricane Katrina on the city in a few hours. Manila is always prone to flooding. Periodic typhoons, low-lying land reclaimed from Manila Bay, faulty and inadequate drainage infrastructure, all make for floods during the rainy season. But the extent of this flood is unprecedented. My family members in the Philippines are safe. My son is in the south of the country, far from the devastation. The ground floor of my ex-husband's house was flooded, but they had time to move furniture and books to a higher part of the house and the clean-up is under way. But the damage to Manila is almost beyond comprehension. There are 250 known deaths, and around 450,000 people have been displaced. 380,000 people are currently accommodated in makeshift shelters. This is hard to imagine. It's the equivalent of one-seventh of the population of Sydney being displaced. It's difficult to conceptualise how Sydney would deal with disaster on such a scale, let alone a country as poor as the Philippines, and with such unreliable infrastructure. Much has been written in many contexts of how and why particular events in the world are reported. The Philippines doesn't figure largely in Australia's world view or its news coverage, and while it is unedifying to compare the horror of disasters, I do wish there had been more coverage and some public expressions of concern and support for the Philippines at this time. Maybe I've missed them. Here's a link for some news coverage, personal stories and photos. Late last week I popped in to one of Sydney's larger bookstores and was confronted by a table piled high with paperbacks and a large sign - 'Cool Scandinavian Crime'. I think we need a word to describe the feeling you have when you realise that something you thought you had 'discovered', and that you prided yourself was a sign of your fine discrimination, has become a mainstream commercial trend. 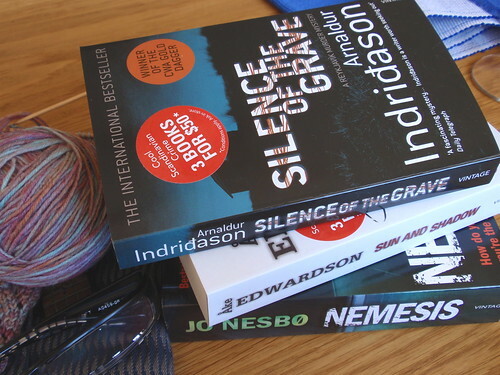 I've blogged a couple of times about my liking for Scandinavian crime fiction, and I've even spent time speculating on why I like it and what it has to offer that is unique and different. But suddenly it's become a marketing ploy. A way to encourage people to buy a job-lot of cheap books. It's mainstream! If I were more generous-spirited I should feel pleased that other people have also found the pleasures of Scandinavian crime fiction - but I just feel miffed that my tastes are, after all, commonplace. I wasn't so put off by this sudden popularity that I resisted the offer of three books for $50. Not a great bargain when compared with my normal buys from the bookshop of doom in the Devonshire Street tunnel, but the combination of some authors I'd not encountered elsewhere, and Arnaldur Indridason's 'Silence of the Grave' made the offer irresistible. I've already whizzed through 'Silence of the Grave'. Indridason's novels are set in Iceland and the stories often deal in subtle ways with notions of continuity and the impact of the past on the present; of leaving and returning; and of the influence of the 'outsider' - for both good and ill. I'm reminded of another of my likes - Danish crime series on TV - and 'The Eagle' whose eponymous hero is an Icelander. So, I'll now have ready access to a greater range of authors and novels to feed my Scandinavian crime addiction. But on the down-side, the thrill of the chase, of searching out and discovering new titles in unexpected places has gone. And I can no longer pride myself on a relatively obscure and discriminating taste. Pride, however minor and harmless, goes before a fall. This was such a quick knit. 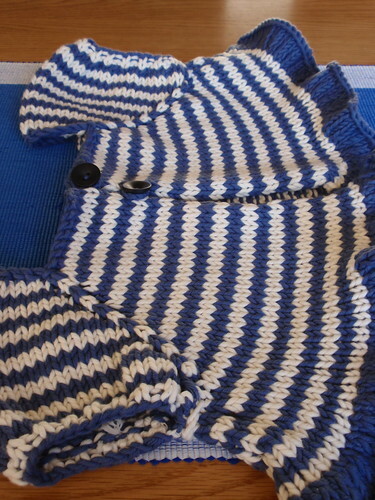 The time taken to wash and dry it, and to buy the buttons, significantly exceeded knitting time. The combination of knitting for a small child (the dotee) and knitting in Aran weight cotton meant it was finished almost before I realised I'd started. I was a bit concerned that the very sporty, traditionally Breton fisherman's combination of navy and white stripes might look odd with the frilled finish. But it doesn't. I think it just looks cute. This is a great pattern - clearly written, realistic sizing, and fashionable without being too much 'of the moment'. It has some really appealing details - the square neckline, the puffed sleeves, the slight flare. I seem to have discovered that there are lots of desirable knitting patterns for babies, but relatively few for small children. 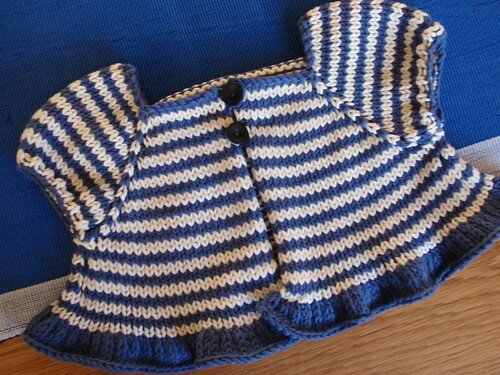 Just as the designers of maternity clothes think they should be super-sweet and feminine, so too the designers of knits for small children think they should be a riot of intarsia and novelty trims (which can be fun as an exception, but not as the rule). So I've been really pleased to discover Alana Dakos's Nevernotknitting site with its hard to resist patterns. 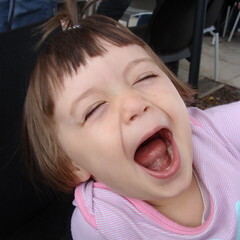 This pattern, Chloe, is from this site. However, I don't think I'll try knitting in Aran weight cotton again - particularly not for small people in the Australian summer. It's a bit too heavy for summer, and the texture of the knit is out of scale with the size of the cardi. I think I might have another attempt some time at this basic style, because I really like so many of its features, but I'll adapt it for 4 or 8 ply yarn, and possibly make it slightly longer. Still, it is cute. And even I zoomed through it. The 2009 Personal Sock Club 4 socks are finally finished. Late. They were due to be finished by July 27, so they're almost two months late. 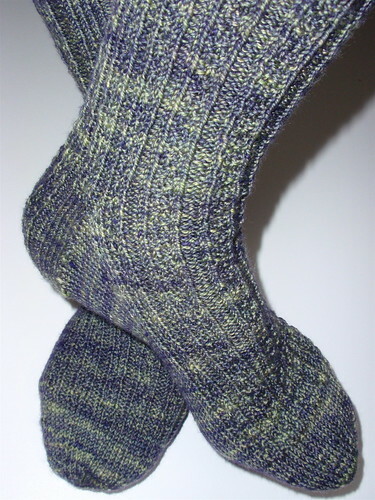 The pattern is Jane Cochran's Hedgerow Socks (free pattern) in Madelinetosh Tosh Sock in Lichen. Restrained, well-written pattern, subtle colour, beautiful yarn. But these socks have taken so much time and effort that the only emotion I currently feel about them is relief at having finished. I opened the much delayed Personal Sock Club 5 envelope and found it contained both yarn and pattern. I'm planning to make Jane Lithgow's Cornish Scallop Socks from Araucania Ranco Multy in a pretty combination of aqua and pink-maroon. 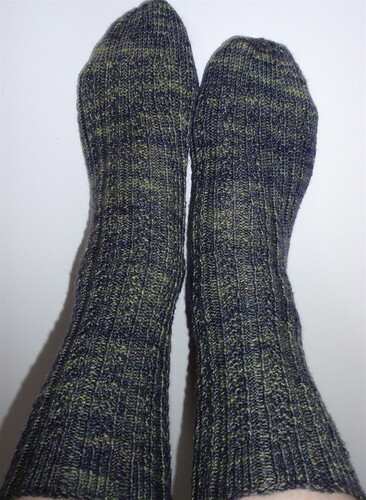 Jane originally knitted the socks with contrast heels and toes, but I'll just knit from the already varied Araucania. I wonder if I can catch up to my schedule by the end of the year? Probably not. Maybe I'll just aim not to fall any further behind. For no particular reason, my life recently feels a bit muddled. I've been rather disorganised - losing things (thank you to all those who expressed sympathy for the loss of the frilled cardi), forgetting things, and generally feeling indecisive and a bit at a loss. As with life, so with knitting. Bits and pieces. Minor chaos. I started work on Evelyn Clark's pattern 'Wildflower'. Essentially, this is the generic stretched garter stitch triangle that characterises the 'Baktus' design, but with an edge of daisy-shaped lace. I like the surprise and unexpectedness of the geometry of the garter-stitch combined with the floral lace edge. 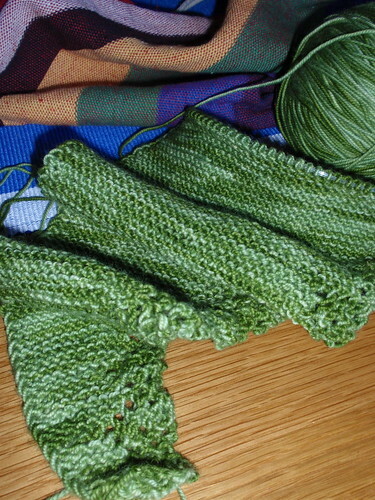 It also seemed especially suited to the spring-green of the Socks That Rock yarn that was a birthday gift from jpofoz. I love knitting this (being such an admirer of garter-stitch), but I've let myself become distracted. With the loss of the frilled cardi, I decided the dotee just had to have a summer cardigan. 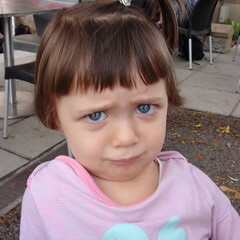 I've just sent off to her the cute pink version of 'Fiona's Top', but that's not a cardi. So I bought some of my very favourite cotton yarn - Lana Gatto's Jaipur in bright lipstick pink, and set about the search for a suitable pattern. 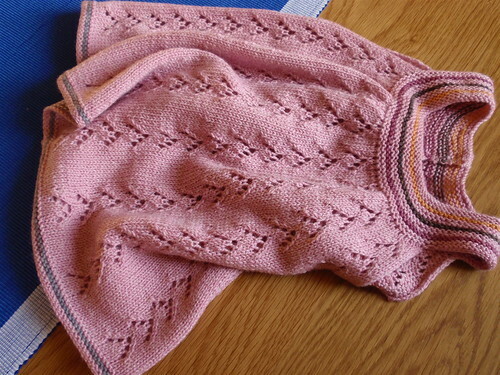 I think I've found the pattern - Cecily Glowik MacDonald's 'Provence Baby Cardigan'(ravlink). I'll have to adjust it a bit for a two-and-a-half year old, but I think that's within my capabilities. I notice Bells has queued this pattern in Ravelry - the knitting pattern zeitgeist at work again - but I can't imagine she'd mind if I also knit it. Have I cast on for 'Provence'? No. That would be too organised. That's still to be done. In the search for a pattern for the Jaipur I was distracted by 'Chloe' by Alana Dakos. It's Lee's fault (ravlink). Lee favorited this pattern on Ravelry and I loved it. I had to cast on immediately and the only Aran weight cotton or summery yarn I had was some light navy and white Jo Sharp Aran Cotton (that's actually a cotton/microfibre mix). Because of the frill on the bottom, 'Chloe' is really suited to light summery colours, but I seem to have embarked on a sporty Breton-influenced colour combination with an unexpected frill. We'll see how it goes. By the way, after knitting a succession of projects in finer yarn on smaller needles, the Aran weight yarn with 5mm needles seems clumsy and uncomfortable, though the rate of progress is some consolation. They're part of my 2009 Personal Sock Club and were due to be finished on 27 July! I'm now more than a sock 'shipment' behind. 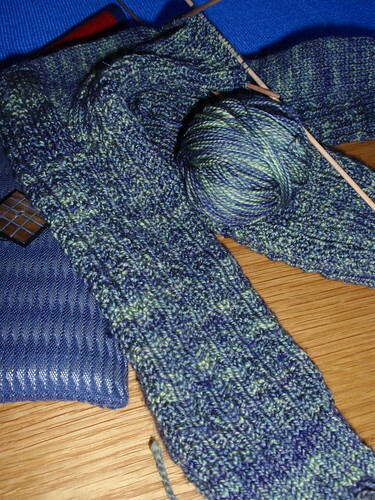 I'm halfway along the foot of the second sock, so a good burst of knitting would see them finished. Then I know I'd feel better. 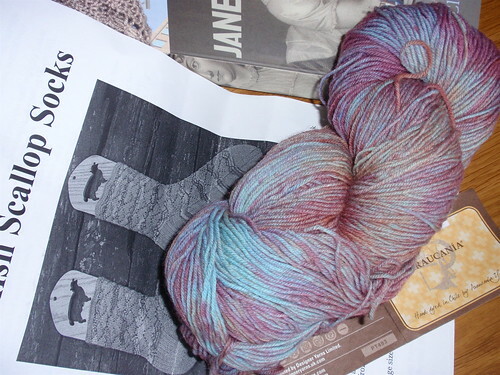 Will I then cast on for the next Sock Club sock? (I'll have to watch these rhetorical questions - I'm beginning to sound a bit Kevin Rudd-ish). I don't know (see what I mean about being indecisive?) I can't even decide if it's these particular socks that are making me feel so grumpy, or knitting socks in general. I know from past experience that this phase of disjointedness will pass. I'll either re-organise myself, or decide some things don't matter and just organise the remainder. And I'll finish some knitting projects, or put them aside for later. Or abandon them. Things will eventually fall back into place. I've finished a new top for the dotee. It's the nth degree of cuteness - some lace, some gathers, and a rather old-fashioned candy pink. 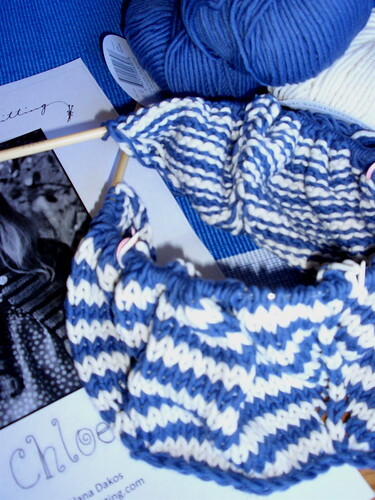 It has stripes of colour on the yoke and at the hem to slightly offset the sweetness of the top. The pattern is 'Fiona's Top' by Sanne Bjerregaard and the yarn is Morris and Sons' Empire 4 ply trimmed with Knitabulous's sock yarn. I'm hoping it will go some way towards replacing the frilled cardi (ravlink) that I'd knitted for the dotee, but that I lost in Brisbane when visiting her the weekend before last! I managed to leave the cardigan in a taxi, and despite several phone calls to try to trace it, was unsuccessful in finding it. So, Ana Maria's new top is off to Brisbane. 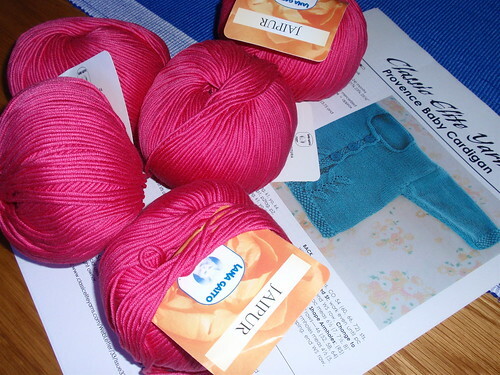 I've also bought some bright lipstick pink Jaipur cotton to make a summer cardigan for her, so I'm seeking suggestions for suitable patterns for a cardi for a two to three year old. 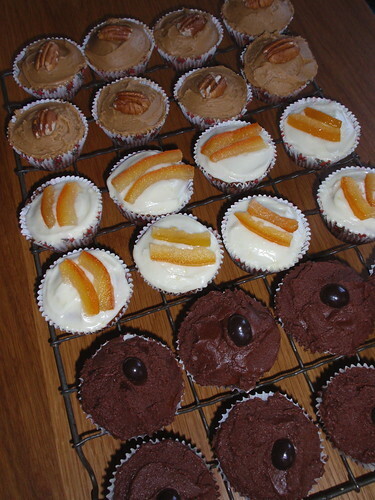 Today I made cupcakes to take for morning tea at the Inner-City branch meeting of the NSW Knitters' Guild. I made chocolate, lemon poppy seed and plain cupcakes with caramel icing. I don't bake very often, but when I do I almost always use my mother's or grand-mother's recipes. They have few ingredients, very sketchy instructions, and are absolutely unsuited to anyone watching their waistline or cholesterol levels. The cupcakes gave me an excuse to resurrect my mother's caramel icing recipe I'd not made for years. It's sweet, rich, fudge-like and very simple. Put all ingredients in a saucepan and gently bring the mixture to the boil, stirring occasionally. Simmer for around 10 minutes, stirring from time to time. Remove the saucepan from the stove and place it in a sink or bowl of cold water to cool it quickly, meanwhile beating it till it thickens. I found a hand-held electric beater is ideal, as it takes longer for it to thicken than you think it should. 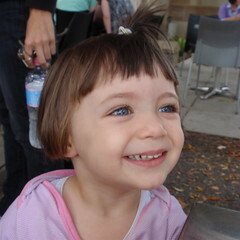 I've been to Brisbane for a long weekend to visit my grand-daughter and her parents. Ana Maria (the dotee) is almost two-and-a-half and at this age children are learning so much - every day brings new developments and achievements. It's breathtaking. We had a busy time, with lunches and dinners out, a particularly pleasant visit to the University of Queensland with its beautiful gardens and lakes and ducks and geese and sleepy lizards, and some shopping. Some yarn shopping at 'Tangled Yarns' in Newstead. This is such a beautiful shop. 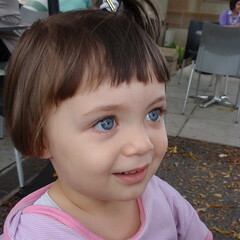 It's probably good that I was accompanied by a small child and that we were hungry. Otherwise I might have spent much longer and much more money during my visit. The yarns are a highly desirable selection, temptingly arranged by brand and colour. There's a small but exquisite range of buttons. There is space to move, and space to linger with chairs at a table and squishy sofas around a coffee table piled with knitting books and magazines. 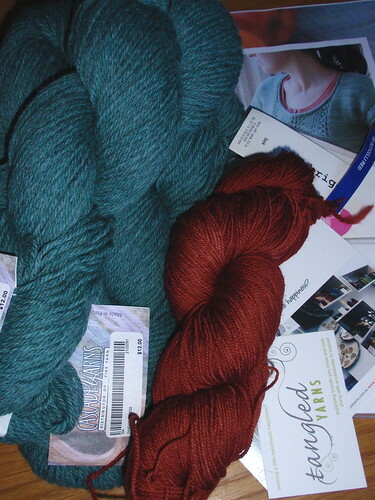 I was restrained and bought only two yarns that are destined for specific projects. Some Malabrigo sock yarn in Botticelli Red for a Damson shawl (I'd intended to buy a dark colour but this red is saturated and rich and was impossible to resist) and some Cascade 220 in a soft jade-turquoise colour to make a Sage Remedy jumper for my daughter. The yarn's a perfect choice for this pattern and I was pleased she was with me to choose the colour. Family, good food, knitting, yarn shopping. What more could I ask for?